This year’s outgoing Master, Michael Mainelli, finished his year with a fantastic Master’s at Home event at Gresham College. The evening was given some extra zest by the appearance of the Lord Mayor’s Sheriffs, Elizabeth Green and Alderman Vincent Keaveny to receive a cheque for the Lord Mayor’s Appeal. In the multifaceted style that we have come to expect, Michael, who is an Alderman and Professor as well as a successful businessman, introduced the theme of his evening, an exploration of Sir Thomas Gresham’s life and legacy. The committee chairs were given small gifts as a token of the Master’s appreciation whilst the Clerk, Gaye Duffy, received a mysterious gift and thanks in honour of her ten years of service and support during the Master’s year. 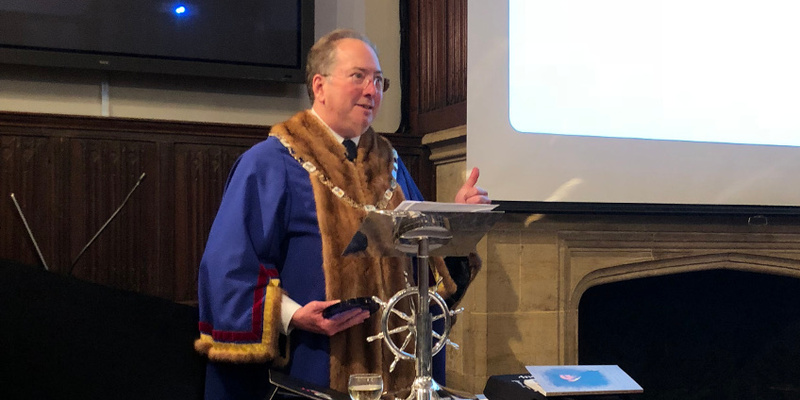 The Master presented an incredible new gift to the Company – a beautiful lectern, made by Tim Lukes who previously made the staff belonging to the World Traders’ Beadle, commissioned by Past Master Wendy Hyde. The lectern is inscribed “Veritatem loquar hominibus et potentibus”. “Speak truth to all men and powers”. The Master confesses that Freeman Robert Pay (based in New York) and Mercer Anthony Hodson helped him with translating the quotation appropriately, derived from the traditional Quaker phrase, “Speak truth to power”. Of course, by putting a lectern in front of a Professor the World Traders were asking for trouble. He really wanted to ‘take it out for a spin’ and adjusted the wheel. Then, opening with a reminder that this was a ‘Technology & Trade’ year, he inserted the blue dilithium crystal to turn the lectern on and started talking. 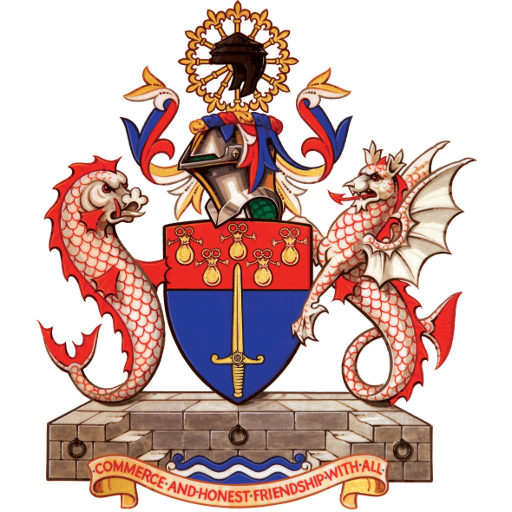 Gresham College was an extremely hospitable venue at which to mark the culmination of a varied, stimulating and exciting year, where accounts of historical figures have rubbed shoulders with exploration of the latest technology. Thank you to our Master, who has so seamlessly blended tradition and progress in a giddying year of memorable events.